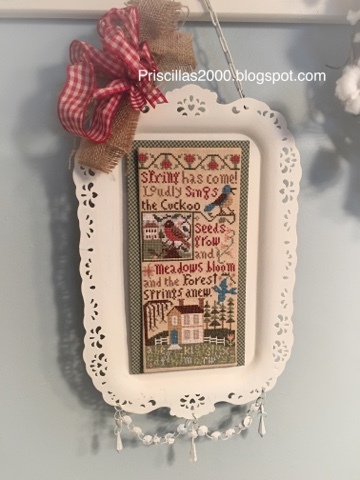 I finished stitching this Prairie Schooler Spring has Come piece yesterday and got it all mounted and on display..I bought this tray at Hobby Lobby 2 Christmas' ago and it was red with a saying. I spray painted it almost black first because I used it for a Halloween piece and then I spray painted it off white because I have different seasonal Prairie Schooler pieces that fit on it. There are 4 Prairie Schooler pieces in this photo .. 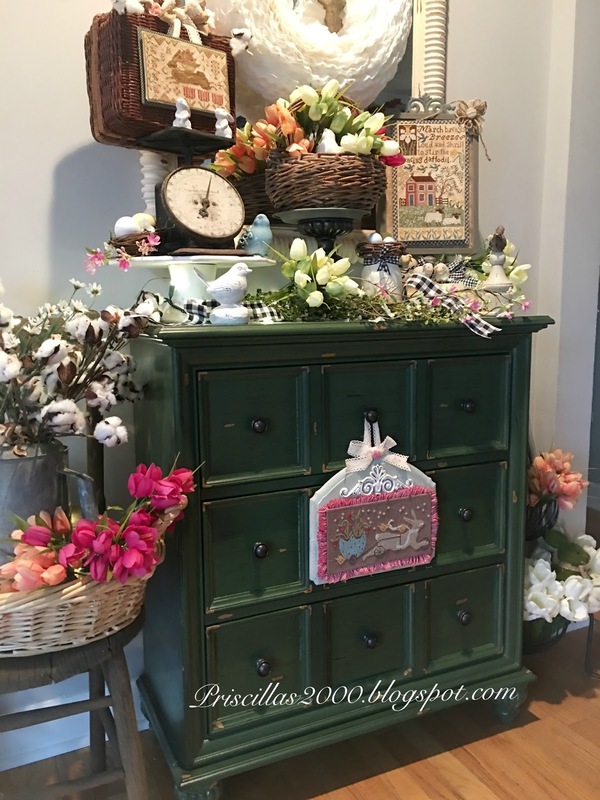 I think I am addicted :) and of course I am addicted to chalkboards.. the collaboration with Hands On Design Chalk for the Home .. Tulip House. 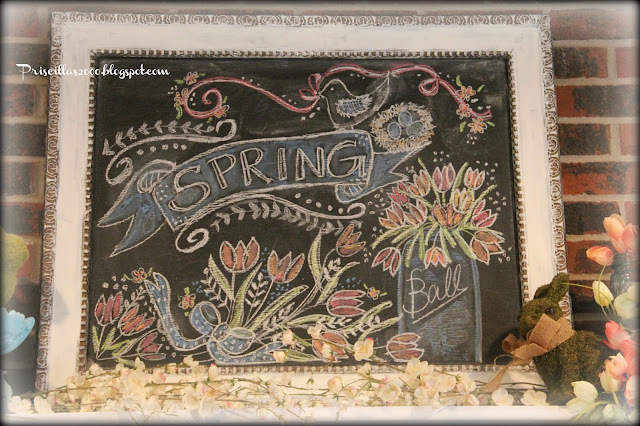 The second chalkboards are all drawn and wait until you see them! 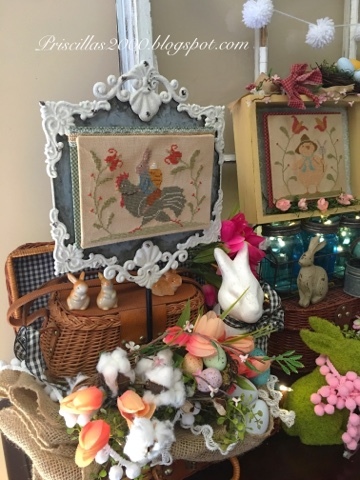 I added magnets to the back of the mounted green gingham and they stick to the tray great ..I changed the dark teal to a lighter color ( dmc 3810) and also stitched the robin square instead of the bunnies. The robin is my favorite of the 4 squares they give you. I left out the all around border. I also used the light pink for the flowers instead of the purple they called for. It's stitched on 28 count tea/coffee dyed evenweave. Isn't it pretty! 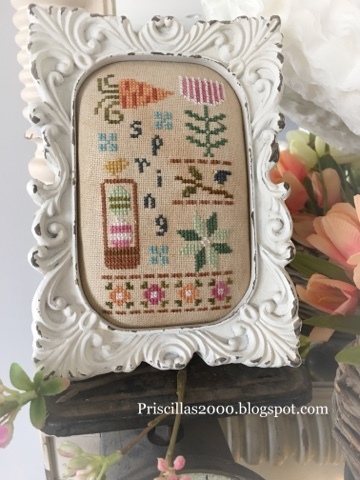 It's not very traditional spring colors but it is so pretty when stitched! Aqua, Red Checks and a Bunny! Do you love it? I sure do! 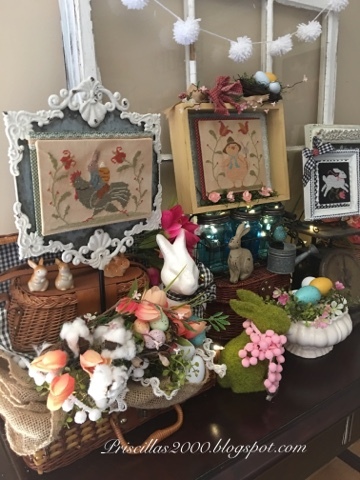 This is With Thy Needle and Thread Easter Peep Parade.. I tea/coffee dyed some 28 count evenweave but it wasn't dark enough so then I used Chocolate brown Rit liquid dye ..It is a little bit mottled and I love how all these threads look on the dark brown.. 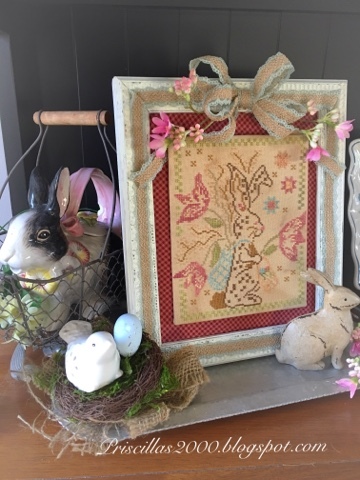 I only had one of the called for threads so I substituted different hand dyed flosses and did the bunny in DMC.. I found this wood piece at Michael's yesterday . 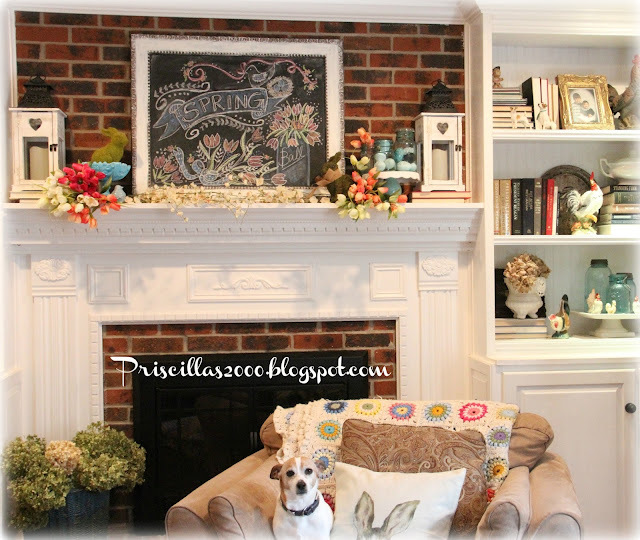 I painted it ( the same color as my kitchen Rainwashed by Sherwin Williams ) and added a brown glaze to the top. I also found the little filigree scroll at Michael's and glued it on. I only had one piece of the sticky needlework board ( OhMyGosh how am I out!?! 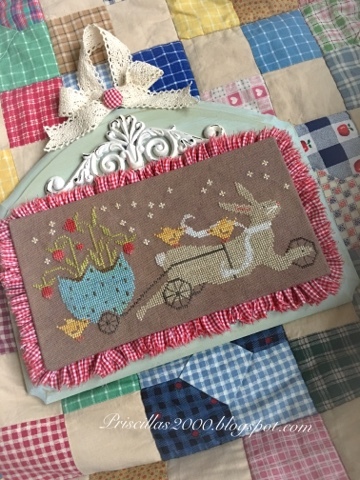 )and knew I wanted a red gingham border on the piece so I ripped red gingham and gathered it by hand and glued it to the back of the piece. Glad I was out of the sticky board :) I added cream lace to the back to hang it and also a bow to the top with a gingham covered button for an accent . I also added magnets to the board and small pieces of sheet metal to the back of the stitching so I could change out the design for another seasonal piece. It's so hard to get a good photo because it is dreary as can be here but I was way too excited to wait to show you all! 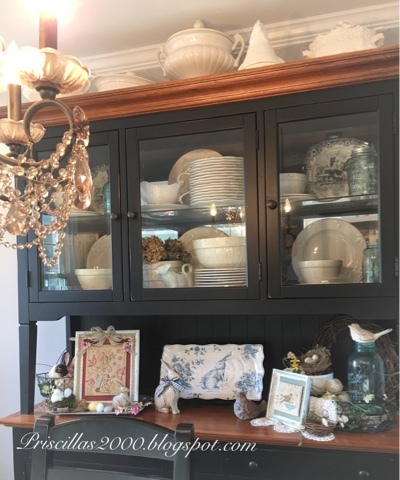 I hung it in the foyer from the green cabinet ..I haven't decided if I will keep it here or put it in the kitchen .. all I know is I love it! I finished stitching these two pieces this week and got them fully finished today.. The first is Springtime Social from With Thy Needle and Thread. 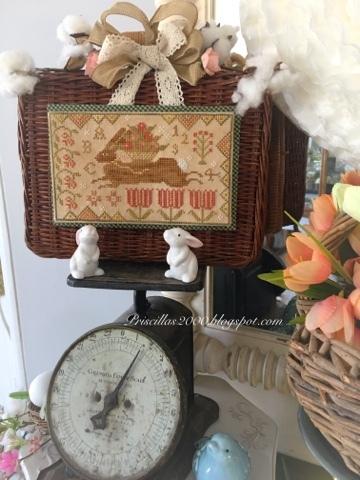 It's stitched on 28 count tea/coffee dyed evenweave..I found this pedestal frame at Michael's .. it is a pretty tall one.. 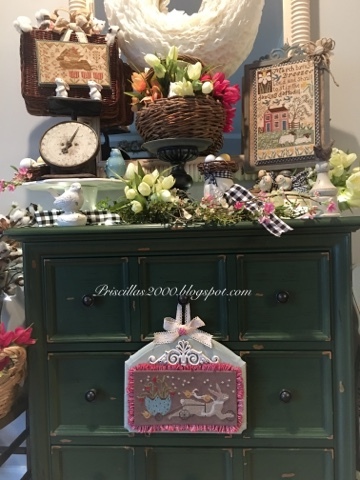 I mounted the stitching on sticky needlework board.. Then mounted green gingham on another piece of sticky board.. glued the two pieces together.. added a couple magnets to the back and stuck it to the board. This little bunny is from Prairie Schooler Book number 52.. I stitched him on black 28 count evenweave. 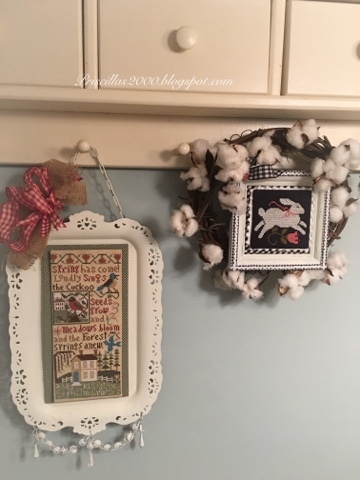 I had found this frame at the Goodwill..I added black gingham to the back of the frame ...and mounted the stitching on sticky needlework board. I used magnets on top of the gingham and a small piece of sheet metal to the back of the stitching. I also added some mini pom pom trim around the back of the stitching. 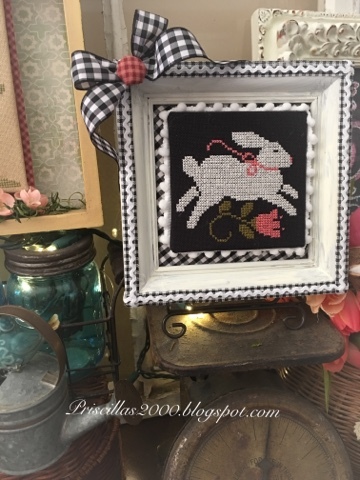 The frame was gold so it got a coat of off white chalk paint ..and then I glued black gingham ribbon around the frame with white ric rac on top. A gingham bow and covered button finish it off.. 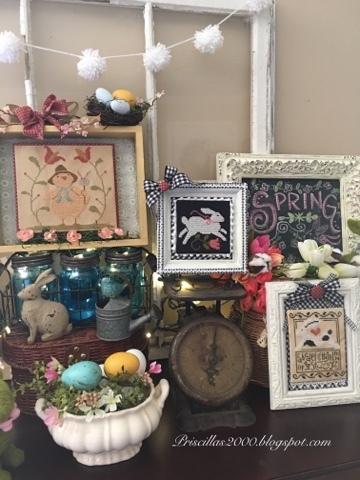 Seems like every time I finish something I need to rearrange all the spring vignettes! 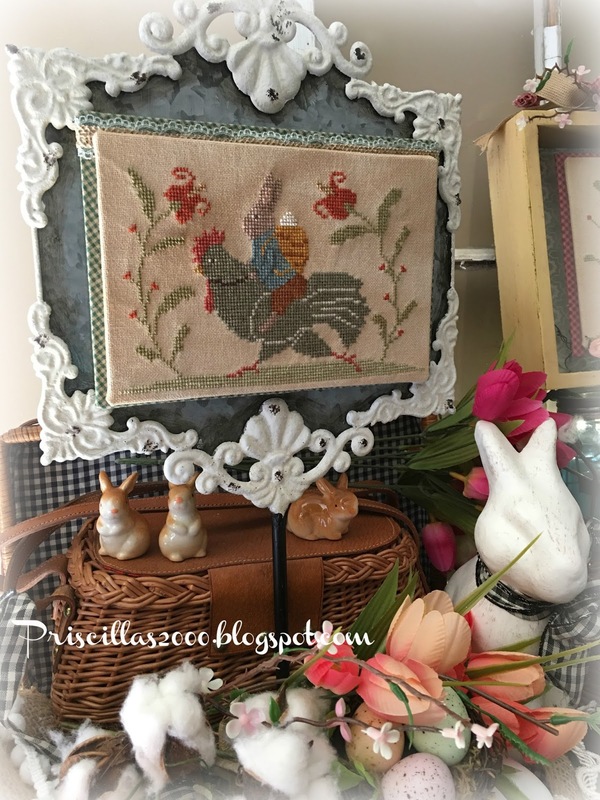 The bunny only took a couple hours to stitch and the rooster with the chicken on his back took a couple nights worth of stitching. We have been having snow and cold for the past few days ..so what better to do than stitch! 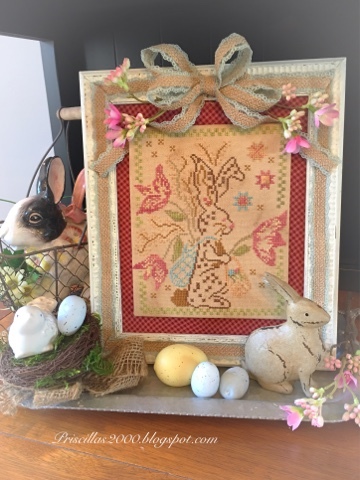 I finished this With Thy Needle and Thread Spring Delivery last night and finished it for display this morning.. I have this thing for buying these little picnic hampers at Thrift stores.. 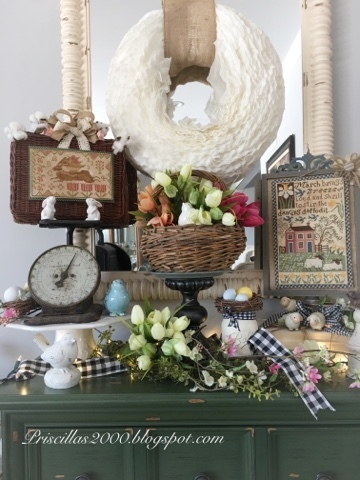 I have a stack of them in the foyer and also this one was on a table in the living room with a bunny plate displayed on top. 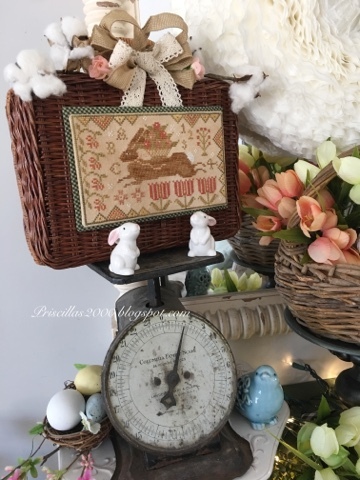 Yesterday I walked by it and thought the bunny I was stitching needed to be on the basket! 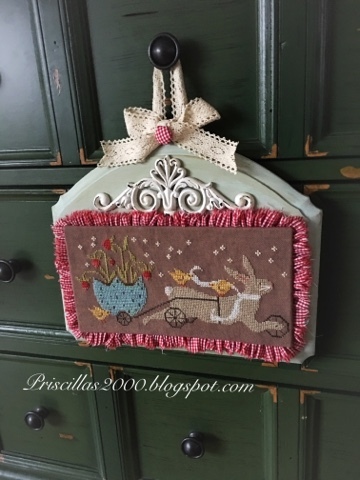 I made a bow out of burlap looking ribbon and added a bow from lace which I glued the tails to the back of the mounted stitching to hang it from ( I didn't glue it to the hamper ,it is tied to the lock on top so if I decide to stitch another piece for the basket I can switch it out) Always thinking ahead! 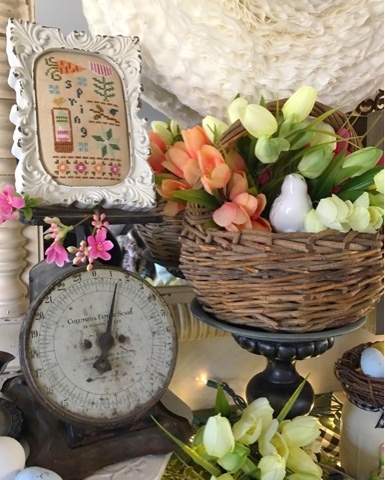 I displayed it on top of the vintage scale in the foyer ..added some faux cotton branches to the top and I am in love! It is stitched on 28 count tea/ coffee dyed evenweave.. most of the called for threads were used I did substitute a few similar colors. 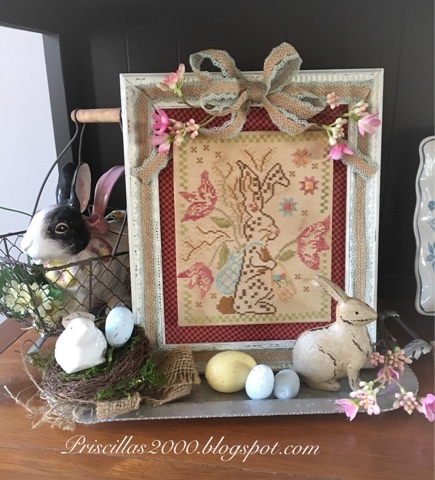 I was lucky enough to borrow this chart from one of my stitchy friends on Instagram .. Easter Parade by Blackbird Designs ..It is really hard to find and expensive if you can find it! 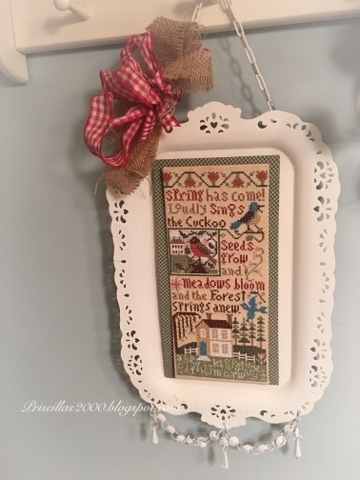 It stitched up pretty quick and I finished it into a thrift store frame ($1.99)that I chalk painted. 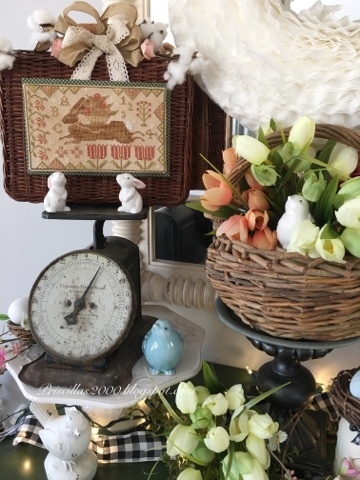 I used the same rose gingham I used for the Easter peep.. I just wrapped the fabric around the board that was in the back of the frame and glued it. 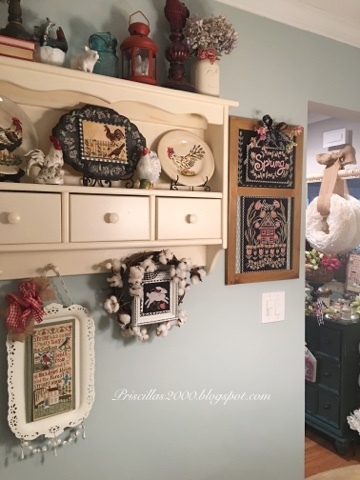 I mounted the stitching on needlework sticky board and glued that to the rose gingham board. 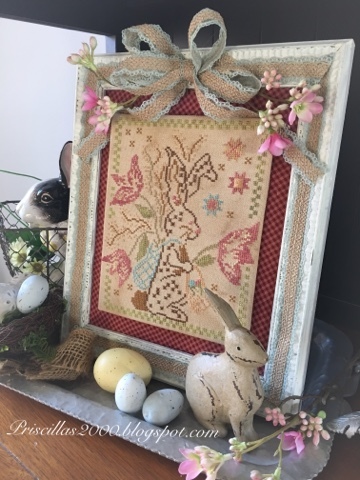 I found this aqua burlap ribbon at Michael's and made a bow and also glued it all the way around the frame. 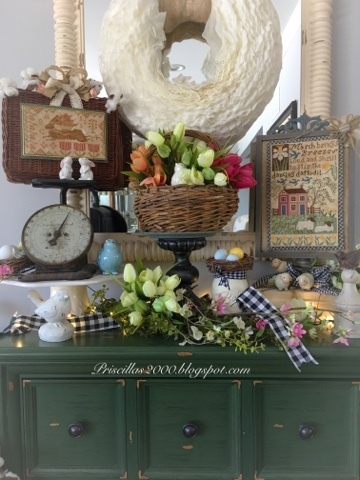 It's on display in the dining room.. with a Fitz and Floyd bunny tea pot in a chicken wire basket. 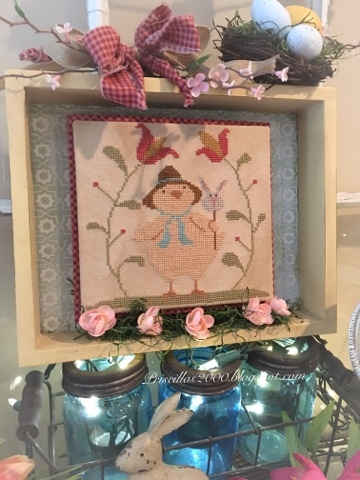 I changed out the dark rose color of the pack on his back , one of the star shapes and also the border.. For the pack I used Gentle Arts tropical ocean and gentle arts avocado for the border.. it is stitched on 28 count tea/coffee dyed evenweave. 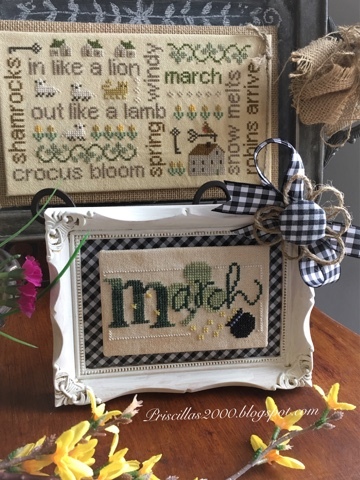 2nd was just finishing up the March word from Lizzie Kate ..February was finished last month so I am hoping to keep up with one a month.. 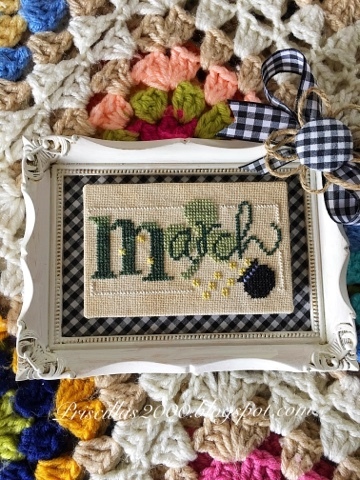 I also added a bow and a twine flower to the top of the frame with a gingham covered button for the center. 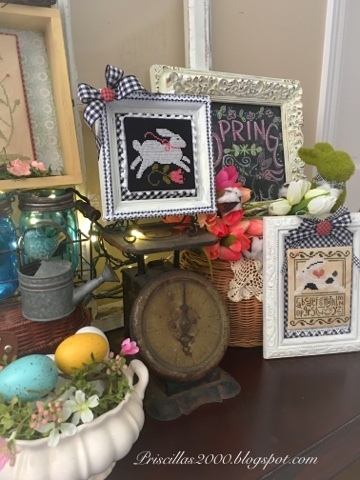 Love that little 99 cent thrift store frame ! 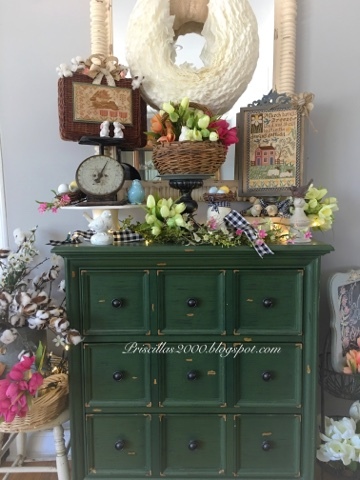 Last is the Spring from Lizzie Kate 4 seasons.. it is small and nothing was really standing out to me how to finish it up.. 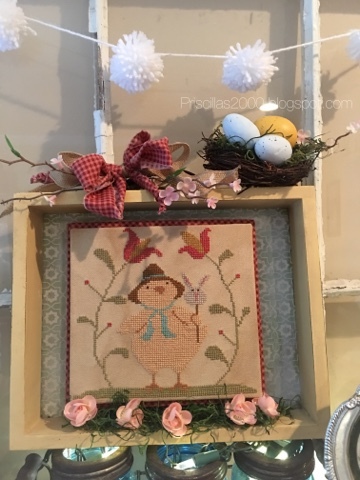 I also found this frame in the clearance at Michael's .Under the stitching it is padded burlap and I just opened the frame back and centered the stitching on top of the padded burlap and closed up the frame. I will be stitching the rest of the seasons so I can just switch them out no finishing required! The frame is really pretty..and you can see inthe photo how puffy it is! Can you stand this cuteness!?! All were stitched on 28 count tea/ coffee dyed evenweave. 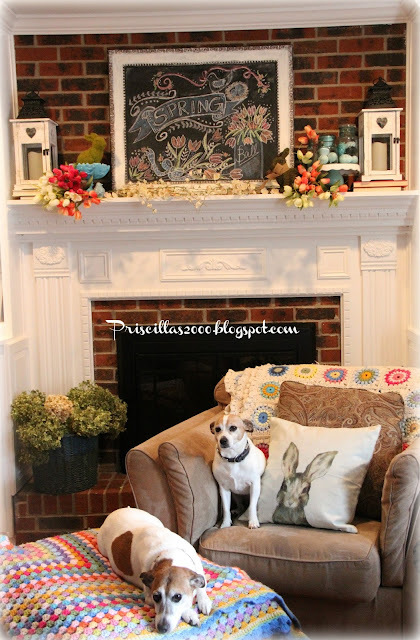 The queens of the house ( Ronnie and Reagan)want you to come in and see the Spring mantel! 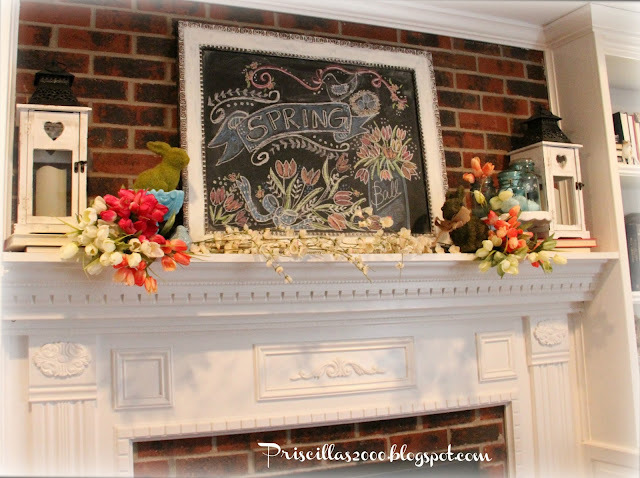 The chalkboard on the mantel has been "springed" up :)..
Moss bunnies, tulips and A pedestal plate of mason jars full of eggs are all on display.. A garland of blossoms is laid down in front of the chalkboard.. Loving the bright colors for Spring! That basket full of dried hydrangeas is from my garden last summer ..Can't wait to be gardening again!